As you know I accept guest posts from people who would like to share their story of healing and hope. When I read Kathy’s story I immediately felt a bond with her and her son. I too have experienced the healing she tells you about below. It’s beyond magical when you have one of these experiences. I know you will be uplifted and comforted by her story. Please share it with your communities as a beacon of light to others! My healing story occurred one night last February. We had a major snow storm which meant my husband and I would not be going to work since we are both educators and schools were closed. Midway through the week, my husband decided he had enough of the cold weather so he packed his golf clubs and drove to North Carolina to enjoy some warmer weather. I encouraged him to leave because I needed some alone time to work through my grief journey which was consuming and tormenting me even though it had been five years since my son passed away. At the young age of 17, my son was diagnosed with leukemia. One day he was playing basketball for his high school team and the next day he was fighting for his life in ICU. The week before his diagnosis, he was home sick with what I thought were “typical” cold symptoms. He stayed home for a couple of days but managed to rally enough energy to return to school on Friday. He spent the entire weekend practicing with his team and hanging out with friends at night. By Sunday, he looked drained and exhausted so I scheduled an appointment. At the doctor’s office, they drew blood and told us it was probably mononucleosis since his glands were swollen. I was concerned because his gums were also swollen and his coloring was not good. I asked him to sleep upstairs in his sister’s room that night because her room was on the same floor as mine and I wanted to able to check on him throughout the night. He didn’t argue with me about this. I felt was odd since, as most teenagers do, his main goal was to spend less time around his family. The next morning I went to work but just two hours into my day I received a call from his doctor. The told me to pack an overnight bag for both of us and go directly to Children’s National Hospital. They said his white blood count was dangerously high and he would be tested for leukemia. I did not want to believe he had cancer but I did what I was told and we checked into the hospital. It turned out to be our home for the next 15 months. My son was diagnosed with AML which is a very aggressive form of leukemia. He received highly toxic forms of chemo that shattered both his body and soul. He fought a tough battle and during his stay in the hospital we had some incredible mother son bonding moments that I will forever cherish but in the end, the cancer won. Robbie died in ICU due to complications from his bone marrow transplant. My grieving started long before my son passed away. Watching him experience the horrible side effects of chemo and the torture of watching his body turn against him was more than any mother should have to witness. I cannot begin to tell you the number of times he vomited or the numerous viruses and illness that attacked his body because the chemo killed everything inside of him. On the day we were informed they were moving him into ICU because his kidneys were shutting down, he turned to me and said, “Mom, I am tired of being tortured”. Hearing these words coming from my son both shattered and broke my heart! One week later, on September 14, 2010 Robbie took his last breath. His sister, father and I were at his bedside telling him we loved him and we would see him again in heaven. I will admit, there was a brief feeling of relief that my son would no longer be in pain; however, this did not last long. The reality that I would never see him again on earth, I would never be able to give or receive a hug from him and never hear his contagious laugh would soon become my reality and my biggest nightmare. Fast forward five years later to this past February and I was still wallowing in my sadness, feeling desperate, and hating life. It was late at night and I had one of those horribly, draining, exhausting grief days. With my husband away and my 15 year old son at a friend’s house, I spent the day doing absolutely nothing. My grief often consisted of days on the couch binge watching episodes of Investigation ID. I crawled into bed late but I could not fall asleep. Suddenly I felt was in a different house. It seemed similar to the house I grew up in and there was an overwhelming feeling of comfort and happiness. I walked up the stairs and at the end of the hall I saw a young man. At first I thought it was my younger son so I called out his name, but as he walked closer, I realized it was Robbie. Without the slightest hesitation, I ran up the stairs to be closer to him and he asked me, “What can I do for you mom.” I said, “Can you just give me a hug” and my son reached out and embraced me with his strong healthy arms. There are no words in the English language that can truly capture the love and healing I felt at that moment. Then he said, “Well mom, this is awkward,” which is exactly something my son would say! He told me there was nothing more that he could do for me and it was up to me to find my way out of the darkness of grief and despair. Then he smiled, and said, “I love you Mom”. The next thing I knew, my eyes opened and I was back in my bed. Because now was when I truly needed him. 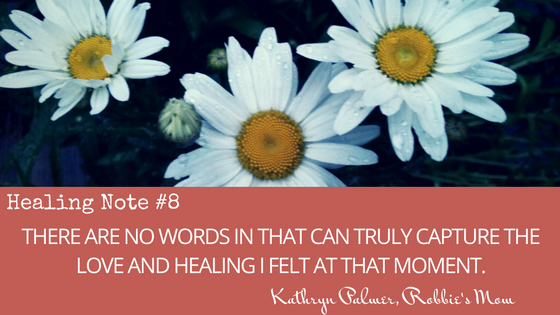 Your story is poignantly heartwarming and beautiful, Kathy. My youngest son died when he was only 13, not from a life-threatening disease, but he was playing with a loaded gun at a buddy’s home, UNsupervised by an adult, along with three other 13 year old boys. Your heartache resonates with me in a deep way. I copied the quote you shared and will ponder it in my heart and mind. It rings with much truth! I just feel so alone without my son. I start crying just writing this. Mark died December 17, 2010 and there’s not a day that goes by that I don’t think of him and that I don’t hurt. I function everyday but I’m not living. Yes, I laugh with the people I work with but it’s always there. How can it not be? He was my “little boy” even though he was 26 and I love him more than anything else. Thank you so much, was exactly what I need it to hear today…..today it’s exactly 2 years since I saw my son for the last time on this earth. He passed away one year and five months ago. He was 25 years old. I miss him so, so much and I ask him for signs every day. Thank you for your sharing. Beautiful. I love signs. They come when we ask and believe. We are approaching the 4 year anniversary of our son, Blake’s(14) sudden death(cardiac arrest. I miss him so very much and would love to just be with him again. I too have had those incredible unbelievable moments of him near. Sending love and peace to you. Thank you for sharing. My son, Benjamin, passed away on September 12th of this year from a very rare type of kidney cancer. Much like you, I was witness to much pain and suffering and when cancer is raging through your sons body along with all the awful side affects of the toxic medications, it’s just too much. I wanted to trade places with him so badly. Two things he said to me that will always resonate – “I can’t do this anymore” and “This is not who I am”. I miss him so much and the pain is more than words can describe. I hope Ben will come to me like your son did.